Small and midsize businesses that track key performance indicators are more likely to achieve their goals for growth, while businesses that have no growth targets are significantly less likely to grow at all, according to a recent survey. The results of Geckoboard’s 2016 SMB Growth and Metrics Survey of 250 small and midsize business owners aren’t surprising. What may surprise you, however, is who’s doing the best job at setting and tracking business goals. Younger business leaders, it seems, are more on the ball than their elders. Leaders under age 45 are more likely to “rely on real-time data to achieve business goals, leading to increased transparency and higher success, as all employees are focused on working towards the same goals,” Geckoboard reports. Only 13 percent of leaders 55 or older said they track their companies’ performance data in real-time. Key performance indicators “help us to measure how well companies, business units, projects or individuals are performing compared to their strategic goals and objectives,” according to the Advanced Performance Institute. A big-brand consultant whose clients include IBM, Wal-Mart, and Toyota, API says well-designed KPIs are vital navigation instruments for understanding a business’s current levels of performance. Geckoboard is an app that creates real-time dashboards for tracking critical business KPIs, and its blog also offers a good explanation of what a KPI is. Real-time tracking is a key to success, Geckoboard suggests. It found that companies that monitored data in real-time were twice as likely as those who did not to meet their growth goals, and over 90 percent of companies that tracked their metrics in real-time met at least some of their goals; 50 percent met all of them. •	10 percent of businesses surveyed do not set annual growth targets. More than three-quarters of those remain small, reporting less than $100,000 in annual revenue. •	Half of companies that track performance data in real-time met all of their business goals. Of those that don’t, less than a quarter met their goals. •	Seventy percent of business leaders say they don’t have insight into company performance on a daily basis. In fact, only 14 percent of all businesses surveyed monitor important metrics in real-time. 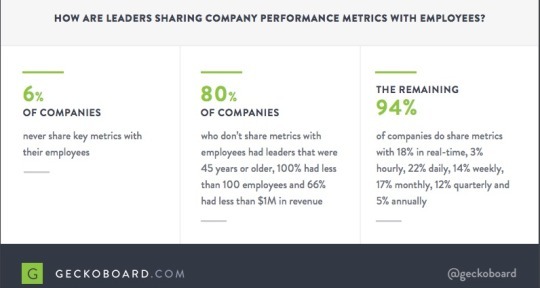 Joyce emphasizes that tracking metrics is not enough: “Business leaders must also make that information available to the entire team to motivate them towards achieving goals.” Again, younger survey respondents were much more open to transparency in sharing company performance. According to the survey, six percent of companies never share KPIs with their employees, despite citing that the most important factor contributing to business growth is every team member having clear objectives and the number two most important factor as every employee being aware of the key metrics which help the company grow. Companies that don’t share their data tended to have older leaders (80 percent had leaders that were 45 years or older) and tended to represent smaller companies (100 percent had less than 100 employees and 66 percent had less than $1 million in revenue).